Labour lost 11 seats in London in the general election. The Tories took Putney, Enfield Southgate, Ilford North, Wimbledon, Hammersmith & Fulham, Bexleyheath & Crayford, Hornchurch and Croydon Central. The Lib Dems seized Hornsey and Wood Green and Brent East, first won by Sarah Teather in the 2004 by-election. 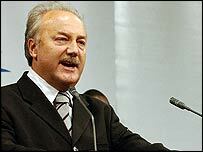 The hotly contested safe Labour seat of Bethnal Green & Bow was won by the Respect Party's George Galloway. But Labour held onto Battersea and Finchley & Golders Green. East London's Ilford North had a swing of 4.6% that saw Labour's Linda Perham lose her seat to Lee Scott. Also in east London, Hornchurch was won by Conservative James Brokenshire from Labour's John Cryer with a swing of 2.7%. Greg Hands won west London's Hammersmith & Fulham from Melanie Smallman. Sarah Teather retained Brent East, although it counts as a Labour loss when compared to the 2001 general election result. Labour's Barbara Roche was ousted from the north London constituency of Hornsey and Wood Green after a huge 14.5% swing to Lib Dem Lynne Featherstone. In Croydon Central, the Conservatives' Andrew Pelling took Labour's Geraint Davies' seat by just 75 votes. The Tories gained Putney as Justine Greening ousted Labour's Tony Colman. The seat was won by Labour in 1997 from former Tory Minister David Mellor. Oona King lost the east London seat of Bethnal Green & Bow with a swing of 26.2% to Respect. Stephen Twigg became a Labour ministerial casualty when he lost Enfield Southgate to the Tories. David Burrowes won the north London seat - gained by Labour from former Tory minister Michael Portillo in 1997. And in the south west London seat of Wimbledon, Conservative Stephen Hammond won with a 7.2% swing from Labour. Join Politics Show on BBC One on Sunday 08 May, at 12.00pm. Join Tim Donovan for an in depth analysis of the election results. So what are your views on this issue? Use the reply form below let Politics Show London know what you think.